U.S. sales of full-size, volume brand sedans slid 3% in April 2016 in large part due to sharp decreases at General Motors. Both the Buick LaCrosse and Chevrolet Impala, presumably due to GM’s de-emphasized fleet business, lost significant numbers of April sales in 2016: 1772 for the Buick; 2689 for the Chevrolet. 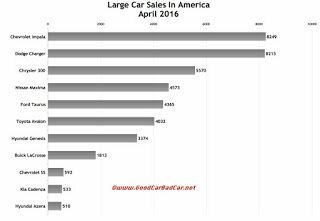 But U.S. sales of the Dodge Charger, Ford Taurus, Kia Cadenza, and Toyota Avalon all fell below their April 2015 totals. And the Hyundai Azera, which Hyundai-Kia will soon forget in the U.S. in favour of the Cadenza – just as the partners have already done in Canada – tumbled 44% in April. 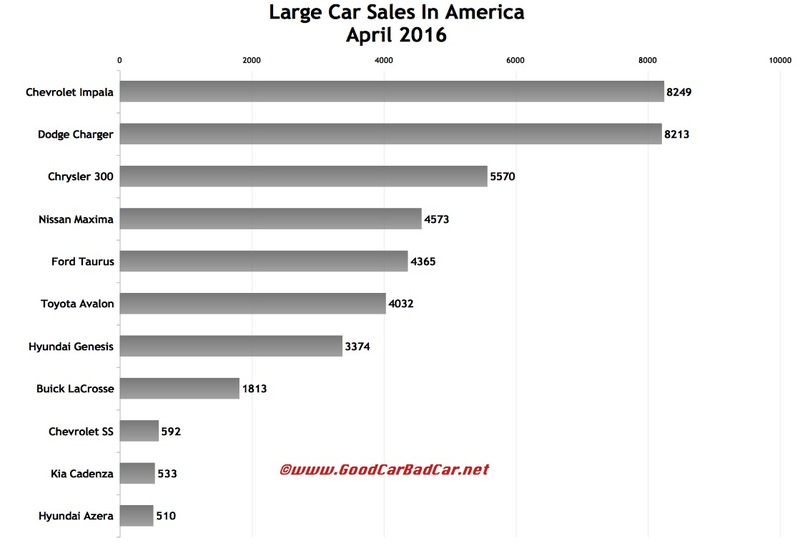 On the flip side, April 2016 was the Chevrolet SS’s best sales month yet. The SS remains a low-volume car – only 592 were sold in April. But the SS has historically averaged barely more than 200 monthly SS sales. The Chrysler 300 also continued its upward trend, and the Nissan Maxima – all-new for model year 2015 – has more than doubled its April and year-to-date sales. You can click any model name in the tables below to find historical monthly and yearly U.S. auto sales data. You can also select a make and model at GCBC’s Sales Stats page. This table is sortable, so you can rank large cars any which way you like. Suggestions on how GCBC should break down segments can be passed on through the Contact page. * Hyundai USA, not GoodCarBadCar, chooses to combine sales figures for the Genesis sedan and Genesis Coupe, forcing us to include the Genesis with these volume-brand cars on pricing grounds before we even get to the “brand status” issue.